What is XML File Optimization for MS Office docx, pptx, xlsx... files? Take a large MS Office file like a PPTX PowerPoint presentation or a DOCX Word document. Did you know that it could be made two times smaller? And at the same time remain a fully standard MS Office document with the same rendering quality. This is essentially what the MK Net.Work XML File Optimization does! 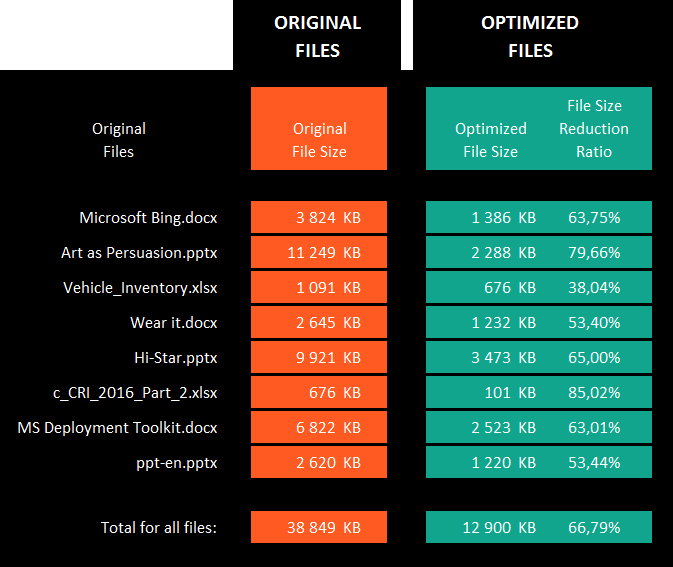 See for yourself examples of MS Office files before and after optimization. Download these files and check for yourself their size and their rendering quality before and after optimization. How does XML File Optimization differ from Zip compression? Zip compression requires Zip decompression. When you Zip-compress a file, the resulting file is a .ZIP file. Hence, You then need to unZip this ZIP file in order to retrieve your original file. In contrast, The XML optimization is applied to the file itself. Thus, an optimized DOCX file is a fully standard DOCX file. It does not requires any "de-optimization" before to be opened in MS Word or in any other application able to open DOCX files. And the same principle applies to PPTX, XLSX and all other MS Office XML files. Contrary to Zip compression, XML optimization is 100% transparent to the users and to the applications consuming the optimized files. Another important difference between Zip compression and XML optimization is that, contrary to Zip Compression (*), XML Optimization delivers very significant volume reduction results on MS Office XML files like DOCX, PPTX and XLSX files. (*) As you probably already know, it is commonly admitted that it is not worth Zip-Compressing MS Office XML files like DOCX, PPTX and XLSX files. This is because Zip Compression is not able to reduce their size significantly. The same goes for picture files like JPG, PNG, GIF etc. files. Zip compression is also inefficient on these files while our optimization software delivers very impressive volume-reduction results. You already have low level disk compression on your file storage systems? Is the MK Net.Work XML File Optimization able to save disk space in this case? Disk compression is like Zip compression. It does not deliver any significant file size reduction on Microsoft Office XML files. You can test this easily for yourself: activate the Windows built-in folder compression on a test folder and copy some non-optimized MS Office XML files provided in our Examples of Natively Optimized Microsoft Office Files page. Then create another folder, activate the Windows Folder compression for this folder and copy the optimized version of these files into this folder. Compare the size of each folder displayed in the folder properties. The same principle applies to image and picture files optimized by our optimization software. You can do the same test with the picture files (before and after optimization) provided in our Examples of Natively Optimized Picture Files page. You already have network compression appliances installed on your networks? Is the MK Net.Work XML File Optimization able to save network bandwidth in this case? Network compression is like Zip compression. it does not deliver any significant file size reduction on Microsoft Office XML files. You can test this easily for yourself: simply send some non-optimized MS Office XML files provided on our MS Office File Before and After Optimization page on your network and measure the network bandwidth consumed. Then do the same test with the optimized version of these files and compare the amount of network bandwidth consumed by these optimized files against the amount of network bandwidth consumed by the non-optimized files. Curious to know more about our optimization software? We have optimization solutions providing automatic and transparent XML File Optimization and Image File Optimization for a large array of email, collaboration and storage platforms. You can find the list of the platforms covered by our optimization solutions in the home page of this site. We also have a quick optimization software guide enabling you to find, in a couple of clicks, the MK Net.Work optimization software you are looking for. The MK Net.Work XML File Optimization is like magic! On average it reduces the size of our docx, pptx xlsx etc. MS Office files by 50%. We use it with MS Outlook (ZipMail for Microsoft Outlook), and with our SharePoint web applications (Z-OptimiZr for Web Browsers). Having the size of all MS Office files reduced by 50% on average makes everything faster. It also enables us to drastically reduce our needs for MS Exchange and SharePoint disk space. The XML optimization process is fully transparent. Users do not even have to know about it. ZipMail and Z-OptimiZr also optimize image and picture files with even better volume-reduction ratios! The size of our SharePoint Libraries was growing out of control. Large numbers of non-optimized MS Office files and image files were causing enormous waste of disk space and network bandwidth. SharePoint performance was also impacted. We evaluated Z-OptimiZr for SharePoint Databases and found that it was able to recover 60% of the disk space consumed by our SharePoint Libaries! The original rendering quality of the MS Office files and image files was preserved by the optimization process. And all of the SharePoint Metadata associated to the SharePoint files as well. The optimization process was thus really 100% transparent for the users. The optimized files stored in our SharePoint libraries being now 2 to 3 times smaller, they are downloaded 2 to 3 times faster. Smaller databases and smaller files to serve also greatly help improving SharePoint performance. We are now evaluating Z-OptimiZr for Web Browsers and Z-OptimiZr for Cloud Storage. The goal being to optimize Microsoft Office files and image files before they are even uploaded to our SharePoint servers by the users. We are really impressed by the high level of transparency of the software, its very small footprint, and by its volume reduction power. Before migrating our file servers to Microsoft Azure, we used Z-OptimiZr for File Servers to apply XML Optimization and Image Optimization to all of our user files. The results were impressive with more than 50% savings on the processed files! Beside the volume reduction benefits that helped us avoiding network bandwidth problems after our migration to the Cloud, the key point for us was the total transparency of the process. The optimization process did not change anything for our users. Even the original date-times of the files were preserved after optimization! After our migration to the Cloud, we faced serious network performance issues. After evaluating several solutions, we found that the MK Net.Work optimization software based on XML File Optimization and Image File Optimization was our best option. The efficiency, the cost, the simplicity and the transparency of the MK Net.Work 0ptimization software were simply unbeatable. Today ZipMail for Microsoft Outlook and Z-OptimiZr for Web Browsers are deployed globally. Our network performance issues have disappeared. We are also more than happy to have seriously reduced the growth rate of our needs for cloud storage. Many thanks to ZipMail and Z-OptimiZr!